I saw the scan and fell in love with it... for obvious reasons that I won't elaborate on =]. I didn't see a vector already, so I decided to do it myself. I changed the colors somewhat to make them somewhat darker and more impactful. I was going to vector a background but I couldn't think of anything that was perfect enough to be worth doing, so I just tried to play off the contrast between white and black pieces in chess. 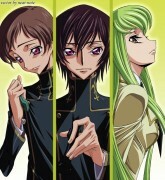 Hardest Part: all the goddamn shadows/highlights in their hair and on lelouch's clothes like wtf. Things I wish I would have done but am too lazy to do: 1) do the outlining better, some places it got to be too thin and was really hard to work with 2) vector a background obviously 3) made more layers for schneizel's clothes so the lines would be more consistent 4) spent more time on schneizel's shadows . also, thanks to Straawbeeryy for pointing out that the jpg quality wasnt very good. LOL. Lelouch clothes definitely got alot of highlights. It`s kind of sad that you didn`t vector the whole scan but nothing too important was down there. Your outlines are nice but it looks disconnected at parts. The colors of the clothes are nice but I think the skin are quite pale. And another thing, you might want to recheck the bottom part of Lelouch and that blond guy`s clothes because there are color leakage. 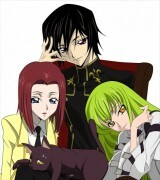 Lelouch`s covered eye looks a bit weird. Scary, I should say. I also think your .jpg quality is quite low so maybe try the save for web option. But overall, I think your vector is quite nice with the details on the clothes. I know what ppl mean when they say "Can't take my eyes off of you..."
Wow! they're so hot in this picture, thanks! 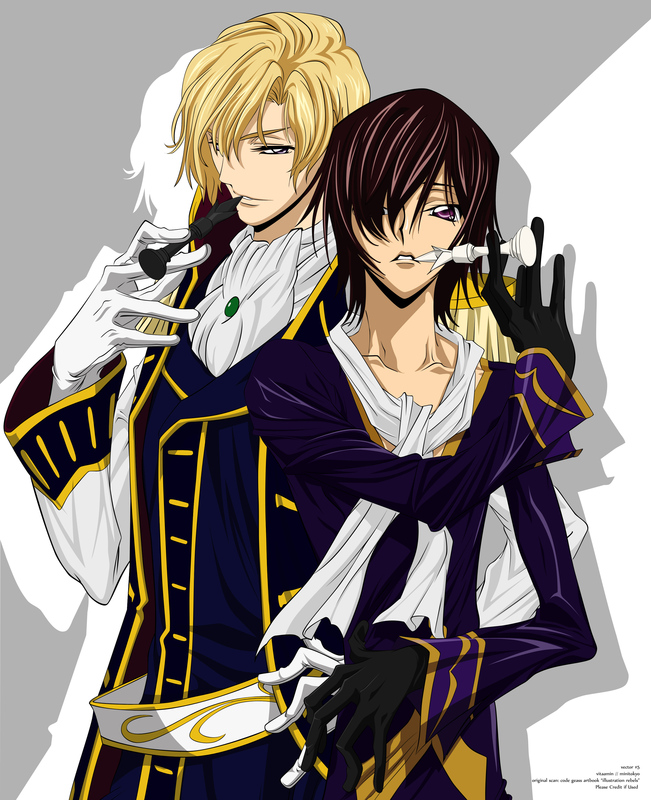 OoooooOooO,, They are so hot...but.. Lelouch... he is HOOOOOOOOOOOOOOOOOOT.